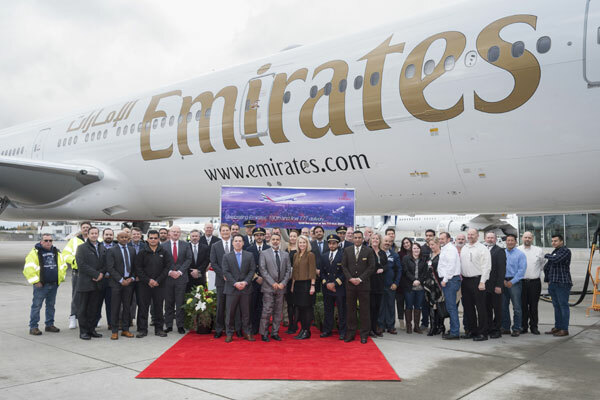 Emirates celebrated an important fleet milestone with the delivery of the final Boeing 777-300ER aircraft on its order books. A6-EQP is the 190th Boeing 777 aircraft to be delivered to Emirates, the world’s largest operator of Boeing 777 aircraft and also the only airline in the world to have operated all the six variants of the Boeing 777 family. One of out every eight 777 aircraft ever manufactured by Boeing has been delivered to Emirates. Emirates will also be one of the first airlines in the world to fly the two next generation models- the Boeing 777-8 and 777-9. It was also the 146th delivery of a Boeing 777-300ER aircraft to Emirates. The airline welcomed the first Boeing 777-300ER aircraft into its fleet in March 2005 and over the last 13 years, the 777-300ER has become the backbone of Emirates’ fleet operating currently to over 119 destinations across the airline’s global network. Emirates has operated one out of every five Boeing 777-300ER aircraft produced to date and the average age of a Boeing 777-3000ER in Emirates’ fleet is a mere 6.5 years.